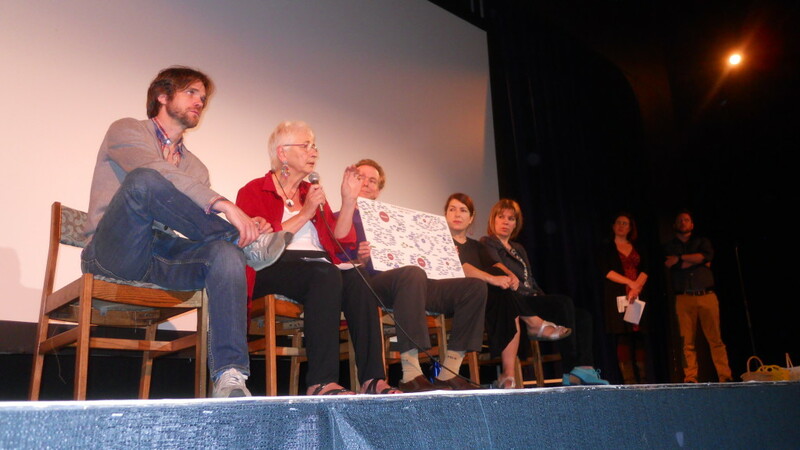 Thank you so much to everyone who came out last Tuesday for our screening of the film GMO OMG followed by a Q&A with the directors and a panel discussion with local & national health & food experts! We came pretty close to selling out the house, with the line going right out the front door and down Wallnut Street! Farmer’s Daughter Catering was there, with the help of a donation from French Broad Food Co-Op, providing the crowd a great spread of finger foods like smoked sunburst trout Crostinis, organic fruits and berries, truffles from the Chocolate Lounge, gluten free brownies from West End Bakery, and fizzy, green kombucha in wine glasses. Parked next door to them was Lookout Brewing offering up GMO-free beers. As if that wasn’t enough tasty refreshment, Purium had a table and they were handing out samples of their sweet, green smoothies, and Nature’s Path had cases of organic granola bars to give out! Also joining us that evening were Sow True Seeds, who had a table by the box office and raffled off a basket of their goodies, and Pristine Clean, who gave away a $100 organic cleaning to one lucky raffle-winner. 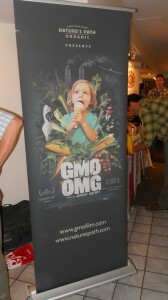 The film GMO OMG follows director and Asheville local Jeremy Seifert as he uncovered truths about GMO’s and their effects on his family, your family, and our environment. The film could be a rather intimidating one if not for the levity Jeremy’s hopeful narration and three kids bring to it, not to mention the uplifting note it ends on with a reel of exciting headlines in the news about folks getting serious about food safety, banning GMO’s, and GMO labeling. GMO OMG reminds us that this is scary business we’re dealing with here but that headway is being made and there is something each and every one of us can do! 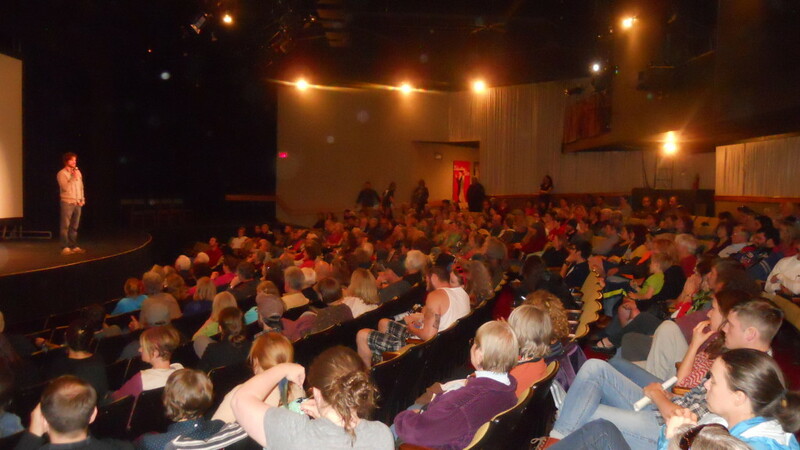 After the film, Jeremy stood up before the packed house to answer some questions. One gentleman raised his hand and asked about the nature of the lawsuits GMO & chemical manufacturers were threatening to bring against states that legislated mandatory GMO-labeling. What legitimate reason, if anything, did these companies have to file a lawsuit? Jeremy explained that mostly they appeared to be idle threats–but very, very expensive, time-consuming idle threats that, until quite recently, seemed to do the trick. We finished up the night with a panel discussion with Director Jeremy Seifert, Carol Koury of Sow True Seeds, Dr. James Biddle of Asheville Integrative Medicine, Rebecca Friedman of Farmer’s Daughter Catering, and Kelly Shea of WhiteWave Foods. And, dang, did y’all have some really great questions! Someone asked Dr. Biddle if he had seen any specific conditions that he believe related to GMO consumption. He explained the correlation between the increase in GMO consumption in this country and that staggering rise in food-alergies, which he attributes to unnatural intestinal permeability created by GMO foods. This lead Executive Director Lee Warren to step in and point out that something like 1 in every 4 pigs in this country is dying of a digestive disorder that many suggest is caused by their GMO-rich diet. Kelly Shea explained to attendees some of the differences between the organic certification and the GMO-free certification–organic certification being a process-based one in which the way food is produced is evaluated for organic standards, and GMO-free certification being a product-based one in which the final products are tested for any GMO DNA. One attendee asked why the gluten-free movement has been so very successful while the GMO-free movement has been mired in challenges. All panelists chipped in on this one, and the answer seemed to come down to one main factor: there is not a host of very large corporations with significant political clout pushing back against the gluten-free movement! I wish I could remember all the insightful questions people asked! The press made it out to the event, as well. Take a look at our write up in the Mountain Express and the Asheville Citizen Times.